Welcome to MOBSA for the 2019 spring season. This year is our Golden Anniversary and we are very excited to begin our 50th season as an association and know that this will be our best season ever ! We have been working together with the township to add turf to three fields at Turkey Brook Park starting this spring, there will be special events throughout the year, and a big end of season 50th anniversary celebration. One change this season is that every baseball and softball family is automatically opted into our Charity Mania fundraiser and will purchase four tickets at registration ($80 total per family). The tickets are active and winners will be announced each week during the spring season. You can decide to sell each ticket for $20, which in turn will get your original $80 back. Or you can hold onto the tickets as a family and possibly win prizes on a weekly basis. With the additions and changes to our program, this fundraiser is critical to the association for many years to come and will help pay for the new turf fields, equipment, maintenance, and so much more. Please note that in order to keep the current registration fees down, our association has removed the $50 family bond that was previously required per family. Mount Olive Township is continuing to impose a $10 Recreation Fee for ALL township sports. This $10 is per child / per sport / per season. No discounts are available. This is NOT a Mount Olive Baseball/Softball Association fee -- it is being mandated by the Township. The fee is NOT included in the registration fees. 3 years. If you plan to coach and are unable of your background check status, please email gregkilka@gmail.com for more information. Mt Olive Twp Police Dept has outlined a process to follow. Here's a LINK to the instructions. BACKGROUND CHECKS NEED TO BE COMPLETED BY MARCH 15. You have 6 weeks to get checked. CenterCourt of Mt. 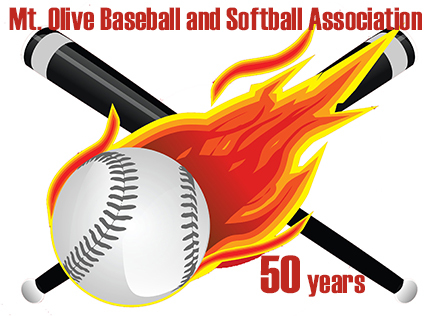 Olive is hosting a Spring Break Baseball Camp that will include Hitting, Fielding, Throwing, Pitching, and Base Running. It's open to all ages from T-Ball to High School. 8:30pm in the courtroom at the township municipal building. Thank you all and see everyone then. Lunch on the course, Gift Bag, and Buffet Dinner. Plenty of Door Prizes, Contests on all Par 3’s, Longest Drive and More….. This is Great Time for Everyone, not just Golfers !! !